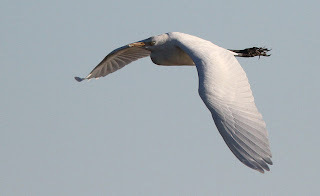 Below, I attempt a presentation of my photographic impressions of the major two-day landbird extravaganza at Cape May, 29-30 October 2010. 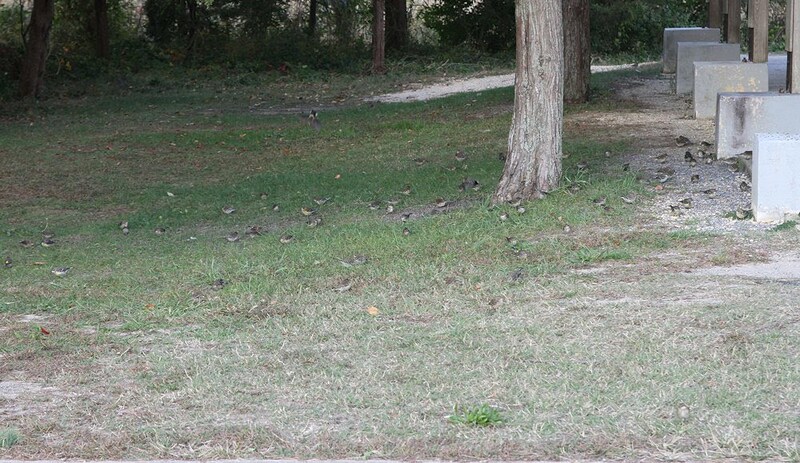 Though I've seen larger overall numbers there -- I was fortunate to be visiting for the million-plus American Robin-and-everything-else flight in November 1999 -- I've never before seen so many birds of such a variety of species on the ground. Literally. As I sift through my memories of what has to rank as among the best two days of birding that I have ever experienced, I find myself returning again and again to four species; four species that, for me, defined this event. While I have, perhaps, seen more individuals in a single day at Cape May for some of these four, the sheer bulk of these four species present EVERYWHERE I went was unprecedented. One of these four is, in my estimation, the iconic species of the flight. 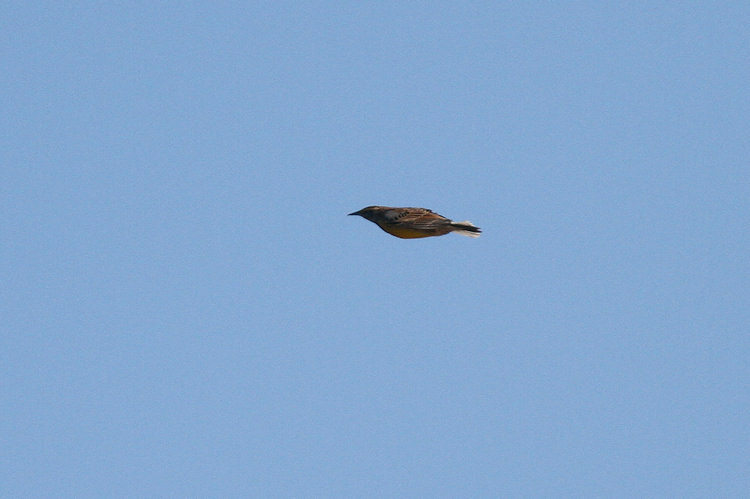 First off, American Robin was NOT one of the four. 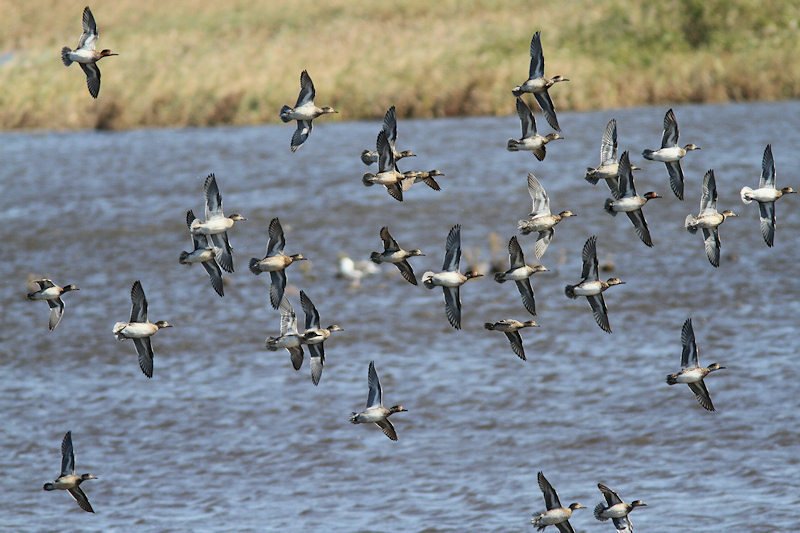 The morning flight of the species on Friday (the 29th) was certainly enjoyable, but paled (and that's too pale a descriptor) in comparison to the November 1999 flight of the species. While this was the largest hit of Swamp Sparrows that I've seen, I have previously seen something in the neighborhood of similar (fall 1991 when I was banding landbirds at Hidden Valley before it opened to the public and I and my assistant -- along with a horde of volunteers -- banded 160 Swamp Sparrows and I don't-remember-how-many-other birds in one day). Besides, I managed to get nearly zero good pictures of the species during this event, so cannot exactly wax photographically poetic with no pictures. This one was not the icon. The number of Myrtle Warblers was astounding, though I have seen Cape Island crawling with such before (late October 1989, I think; my first fall on the Hawkwatch). This one was not the icon. 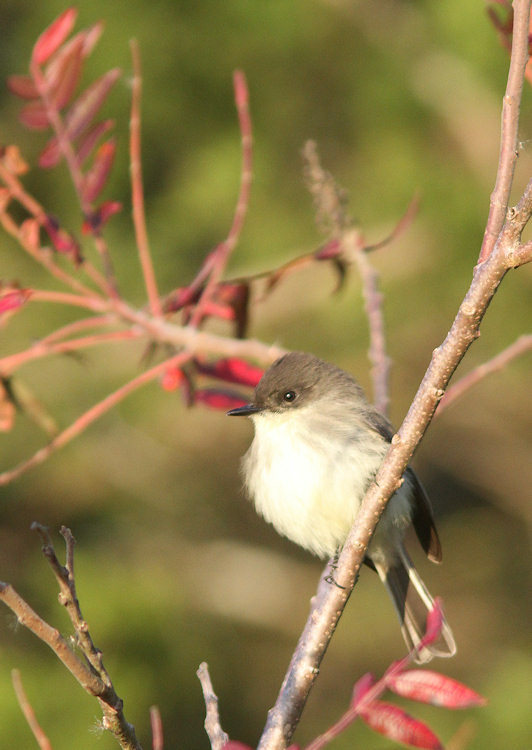 While the species was not the icon, this was, far and away, the largest hit of Eastern Phoebes that I have seen or, even, contemplated. I've never seen so many Eastern Phoebes in such small chunks of habitat getting along with each other, as they're normally quite firm about defending their personal space. The icon? Well, I'll let that bubble for a bit as I present my promised photographic impressions of the flight. 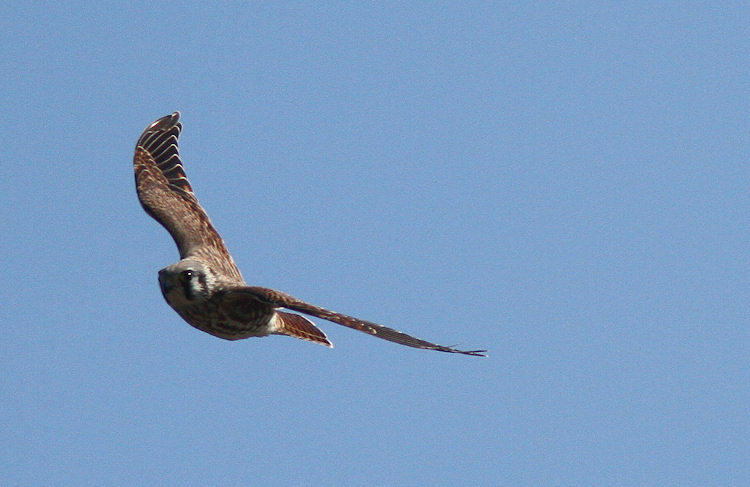 [Most of the hawk trappers kept their mist nets closed during this event, in order to not have to spend their days extracting songbirds, rather than raptors. These furled mist nets provided additional perch sites for a variety of species, including 2-3 Eastern Phoebes at the Meadows trapping station. "Good, it's going to be good. How's that?" "It's not bloody good enough, is what it is." Richard doesn't mince his words. 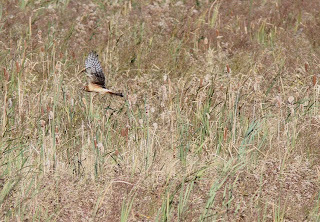 Although the hawk flight slowed down quite a bit in the afternoon today, consider that the calm before the bird storm. If someone were designing the perfect weather pattern for NJA's Cape May Autumn Weekend, this is what they would have done. I mean this, what's happening right now, and what's going to happen the next two days. Frontal passage + northwest winds through Saturday morning. 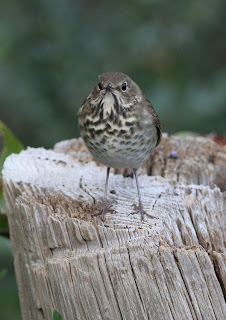 Hawks, sparrows, finches, pipits, late warblers, and yes, robins. Great songbirding Friday and Saturday, great raptor watching Friday for sure, probably Saturday, at least in the morning. Stay tuned. First, the weekend: the stars and weather are aligning. Check out the frontal passage forecast for Thursday if you don't believe me. With south winds until then limiting migration, and northwest for Friday, Friday night and Saturday, if I were you I'd get on the phone right now, 609.861.0700 and see if you can still get in on CMBO's 64th annual Cape May Fall Weekend , this Friday through Sunday October 29-31. A lot happened yesterday, but I'll be darned if I can remember it all. . . Luckily, we have View From the Field to fall back on, and, ah yes, there was a spectacular scoter movement of over 43,000 birds at the Seawatch, and a decent hawk flight early that collapsed at noon when the wind died. An American Bittern has been flirting with hawk watch observers, and Bob and Mary Ellen Claussen had a Clapper Rail on Lighthouse Pond east on Saturday, unusual for the site, since it's freshwater. Perhaps yesterday's avian high water mark was, can you believe it, the House Finch flight - anyone who was paying attention noticed them, and Tom Reed, Sam Galick and others were more than paying attention. 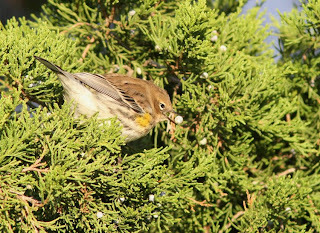 Per Tom Reed: "Regarding today's [Sunday's] finch flight- it's probably safe to say that there were at least 3000-3500+ House Finches moving through Cape May today, as Sam and I only started counting once we realized there were a lot of them, and there were still flocks moving through after we stopped counting at 10:15, continuing into the early afternoon. 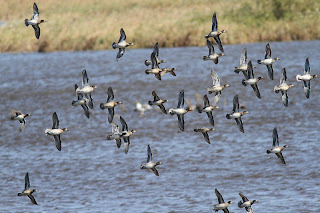 Tom had about 1500 from the Dike; not sure how many of his were the same as ours, as most of ours were coming in from the E or NE, and most of Tom's were also southbound." Orange-crowned Warbler was a nice find on the Villas WMA walk yesterday, and Cynthia Allen noted another from her yard - now's the time to look for this species along field edges with rank, weedy growth next to brush or woods. Today [Monday] has been pretty busy, e.g. 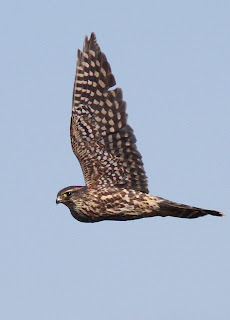 Northern Goshawk at the hawkwatch and also an American Golden-plover mixed in with a flock of Black-bellieds as flybys there. 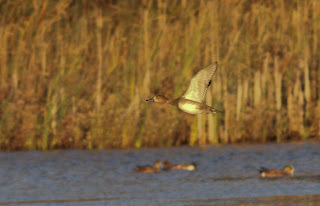 The South Cape May Meadows Green-winged Teal flock has grown to well over 200 birds. Other meadows walk highlights included 2 Lesser Black-backed Gulls on the beach (photo at field trip reports), several Eastern Meadowlarks, and nice looks at scoters and Northern Gannets offshore. So yesterday I worked, really worked, the Beanery fields for sparrows, which leads me to philosphize about what that means. Sparrows are a pain, or a challenge, depending on your point of view. First, you have to dig for them, working the thickets or fields as they flush up in front of you, drop out of sight, and only rarely give you the kind of look you'd like. There's no substitute for patience, stealth, occasional pishing, more stealth, a flamethrower (kidding. . .) For example, yesterday I'm fairly certain I saw a dozen different Vesper Sparrows, but do you think I could get a clean photo of one? No. 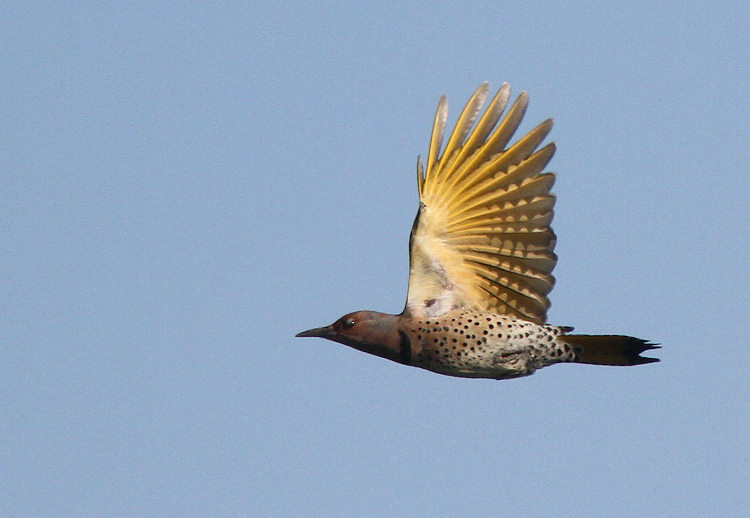 And yet: Song Sparrows have long tails; Savannahs have short tails. 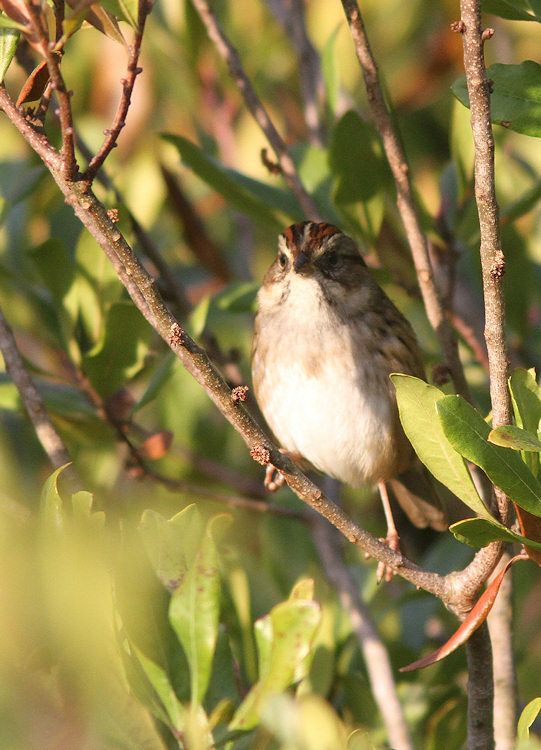 The pale head stripes on Song Sparrows are gray; on Savannahs they are white, off white, or yellowish, but not gray. 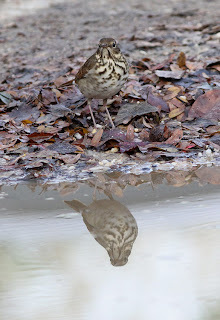 Song Sparrows have thick, coarse streaking; Savannahs have fine, crisp streaking. Song Sparrows pump their long tails when they fly off, and fly off low, often into cover; Savannahs fly off in a rapid but erratic, somewhat jerky flight and often land on top of bushes or even trees. 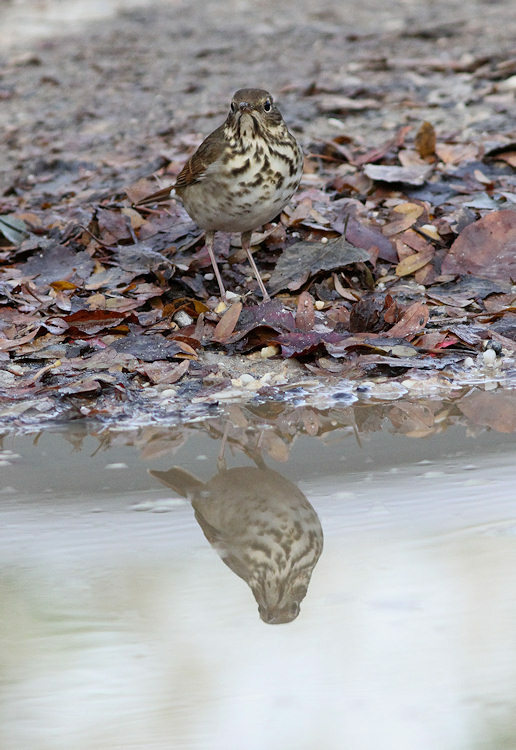 Song Sparrows have rounded heads and fairly stout gray bills; Savannahs often show a crest or peaked head and have small, mostly pale bills. Their calls differ. They are not even in the same taxonomic genus. The first sign that Cooter is around is usually when you notice all the ducks panicking on Lighthouse or Bunker Pond in Cape May Point State Park. Here, Cooter drops in on the only American Coot that had ventured into the middle of the pond. The disappearing coot is responsible for the splash on the right as it dives for cover. Cooter waited patiently an inordinate amount of time, but the coot inevitably had to come up for air. I think that coots are pretty much doomed here as the ponds are very shallow and full of copious amounts of water weed. Thus coots have no escape; they're not agile enough in flight to escape and they can't escape under water because the water weed impedes their movement too much. ....because the gull has a much longer reach and can now get to the coot's exposed under belly. I notcie from the CMBO blog dashboard that Don has a blog in the making, so I won't pre-empt anything he may be reporting shortly. Suffice to say that, Cape May continues to bristle with great birds and a dampening down of light rain this afternoon has set the Spring Peepers off outside my office window! 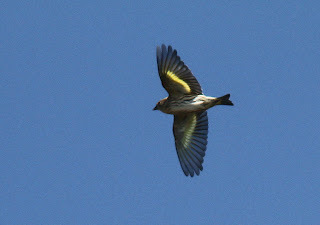 Golden, Rough-legged, Western Kingbird, Lapspur. . . Dawn: fallout of sparrows, kinglets, a few warblers, and a great early hawk flight around Cape May. 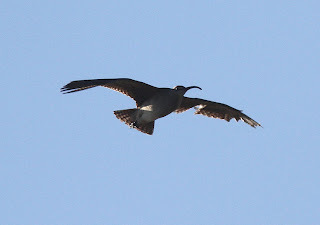 See our field trip report from Higbee Beach WMA for an example of what was around. Besides the sparrows and normal late-season warblers, I heard about onesies and twosies of Black-throated Green, Tennessee, and Nashville Warblers. 11:27 a.m. Juvenile Golden Eagle at hawk watch. 12:45 & 12:52 p.m. Back-to-back Golden Eagles at Hidden Valley, with at least one nearly simultaneously reported at the hawk watch. 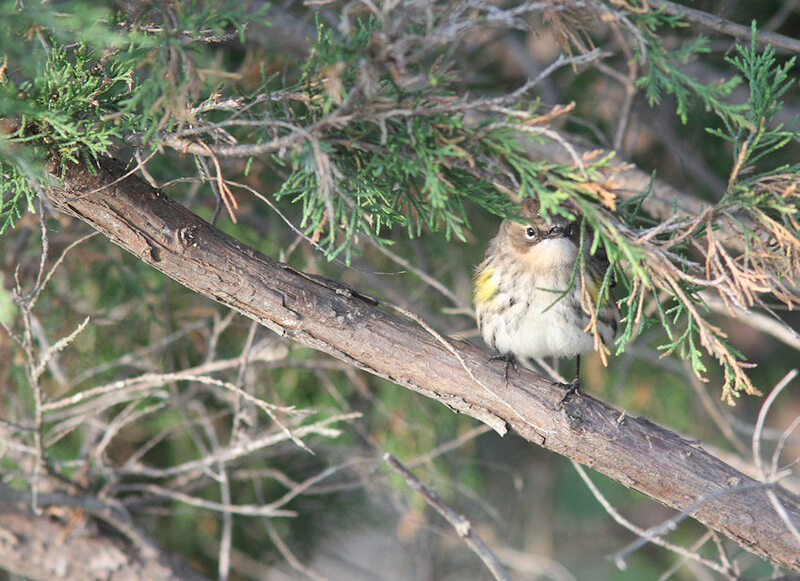 I was at Hidden Valley, which also featured hundreds of sparrows and American Goldfinches. Among the sparrows were 4 Vespers and multiple White-crowneds. 1:45 p.m. Light morph Rough-legged Hawk at Cape Island Preserve (Doug again). 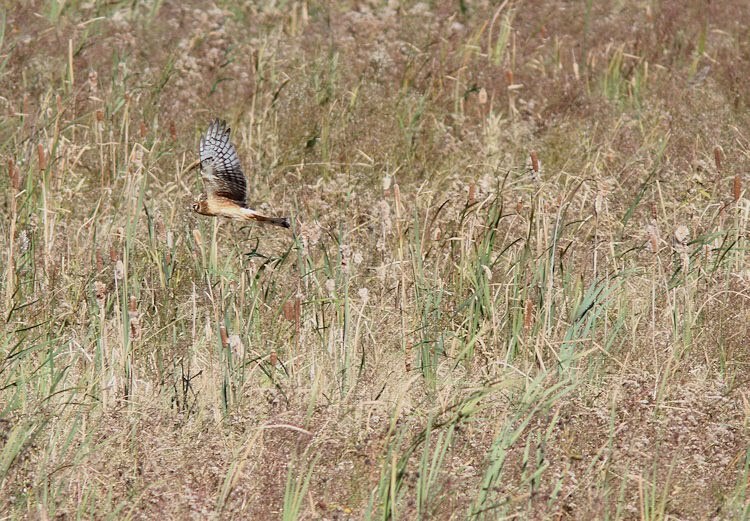 Around this time we were watching a great hawk flight at the platform, though the Rough-legged never showed. A cooperative perched Vesper Sparrow from the platform was some consolation, as was another flyby Cave Swallow and a couple flocks of scoters, one of Black, the other Surf, flying overland over South Cape May. 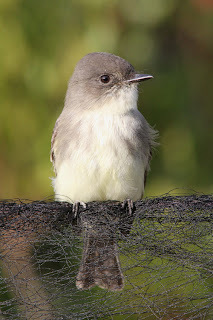 1:56 p.m. Western Kingbird found by Pat Sutton at the Beanery, in the "back field," reached by going through the wet woods on the main path and turning right towards the sheltered corner. 3:30 p.m. Lapland Longspur at the Beanery, in the back field Pumpkin Patch - Doug again. 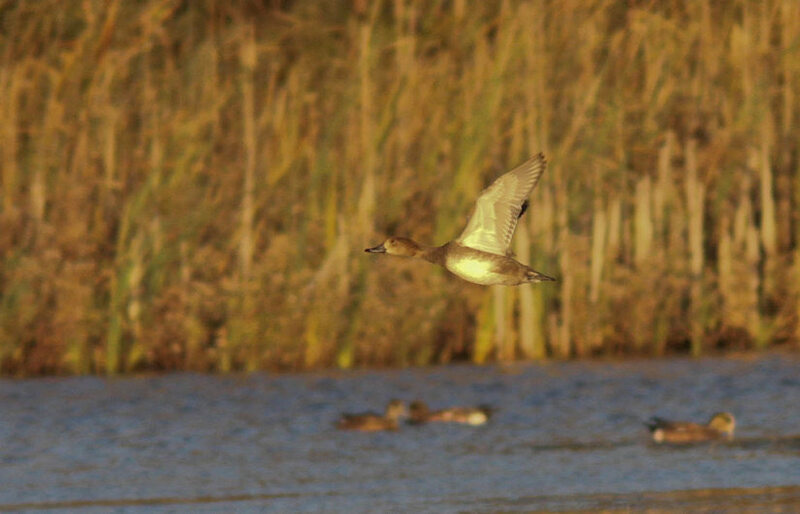 5:55 p.m. female Redhead on Lighthouse Pond (Tony Leukering). What an amazing Cape May day. . .must sleep now. . .be sure to check View from the Field for count results and also killer Northern Shrike photos. 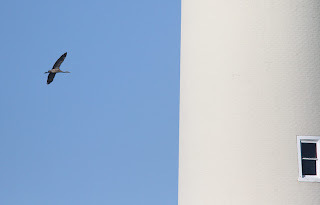 . .
"McDuffy Barrow reports a White-tailed Kite in the Forsythe NWR impoundment along Bayshore Drive in Barnegat Township. Note this is NOT the same as Barnegat Light and is on the west side of the bay. Specifically, the bird was sitting on an island with cedar trees and visible from Bayshore Drive opposite the public beach. From the public beach parking lot look west into the impoundment. Any further reports are appreciated." This would be a second state record. Given the pending weather conditions, if the bird moves south in the next 24 hours it will almost certainly wind up in Cape May, thanks to forecast strong west winds. More info will be posted here as it comes in. Tony Leukering was out on a boat this morning and encountered 2 Humpback Whales off Atlantic City, possibly viewable from shore. Perhaps they'll head down to the Avalon Seawatch, where Doug Gochfeld had an adult Pomarine Jaeger flying south this morning. Whales from shore aren't exactly everyday events, and neither are pom's - Parasitic Jaeger is much the expected from-shore jaeger, and I have seen exactly one whale from shore since I've lived in Cape May, that being a Fin Whale off the meadows in June, I think 2007. 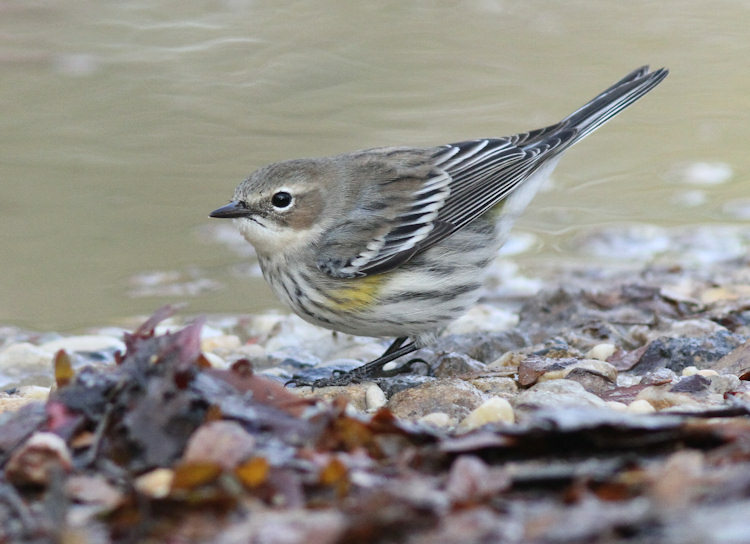 The crepuscular Tom Johnson found a high rate of nocturnal flight notes in Cape May City this early morning, including Yellow-rumped Warblers and House Finches, the latter not often heard at night. 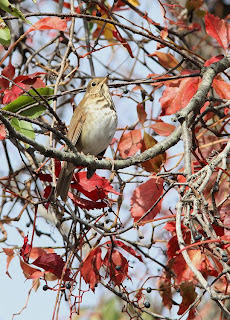 I heard a number of Swainson's and Hermit Thrushes in the predawn flying over the Delaware Bayshore north of Cape May, heading north as they often do right before dawn. 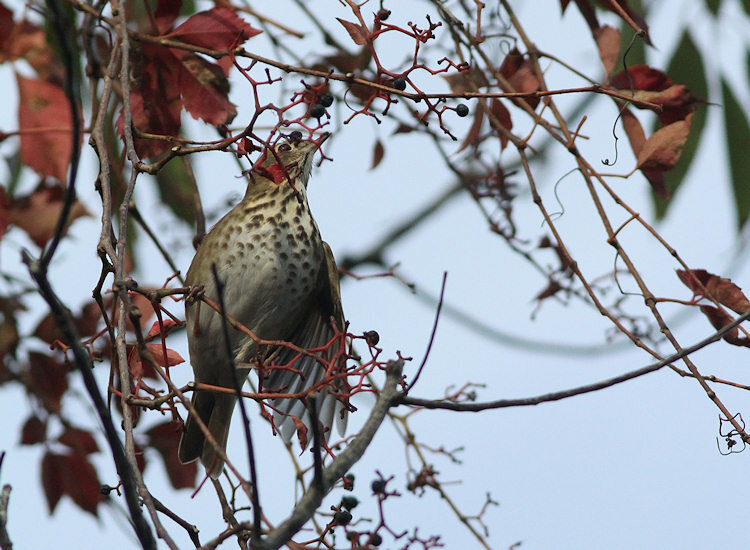 Thrushes seem to engage in "morning flight" before morning comes. One of a minor influx of Cattle Egrets lately is the bird currently at the corner of Bayshore Road and Stevens Street in Cape May. And yes, Friday. We've had fairly steady migration for several days, but a fairly massive high is supposed to build in behind a passing cold front towards the end of the week, and it seems like Friday will be a really good day to take off from work. . . Enough already! (Say those of us confined to the office!) 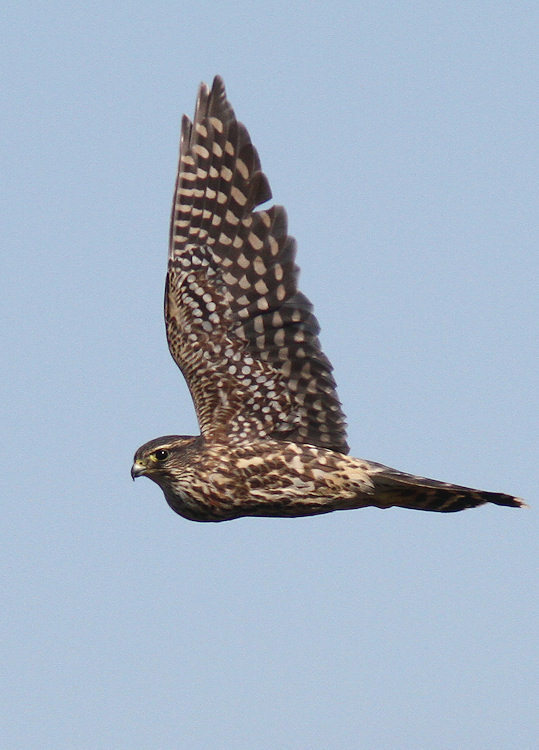 A juvenile Northern Goshawk was recorded at the Cape May Point State Park Hawkwatch a bit before 4 p.m., another first of season. 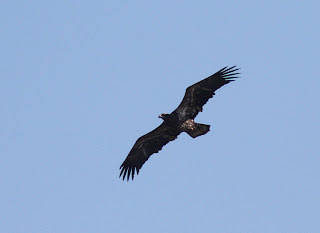 The season's first Golden Eagle, a juvenile, appeared over Cape May early this afternoon, somewhat humorously reported simultaneously by multiple observers watching from different locations, including the hawkwatch. Northern Shrike! Scissor-tailed Flycatcher! Sparrows! Pretty happening morning so far. A Northern Shrike appeared at the Higbee Dike, where (I understand) it was well photographed. Apparently it flew north across the Cape May Canal and hasn't been reported since. Northern Shrike is a very rare visitor here, and this one is quite early, too. Tom Johnson coined the morning flight at the dike "nuthatchpalooza," we'll see what that exactly meant on his blog post tonight, I'm sure. 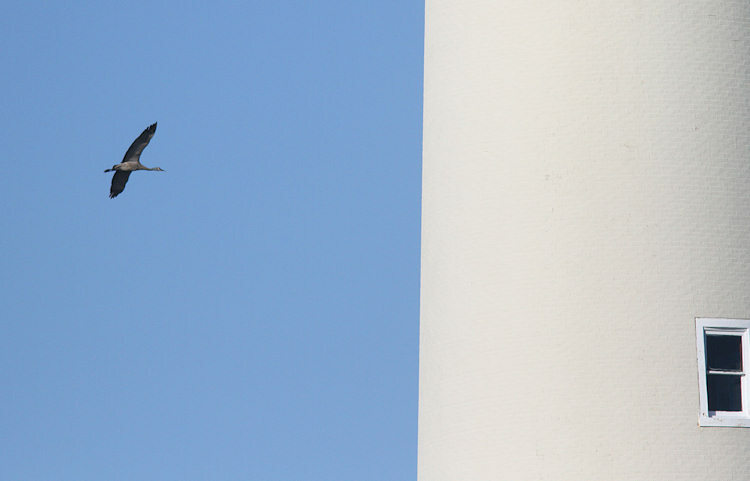 Meanwhile, Doug Gochfeld spied a distant Scissor-tailed Flycatcher from the Cape May Point State Park hawkwatch platform, northbound along the bay. This bird has not been refound, but watchers at the platform this morning have extracted Clay-colored, Vesper and White-crowned Sparrows from the surrounds. 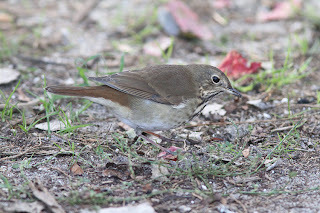 I understand the CMBO sparrow workshop had 5 Vespers at the Beanery yesterday, one of the best places to find this bird. A moderate hawk flight was underway, with Bald Eagle, Cooper's Hawk, Sharp-shinned Hawk, Broad-winged Hawk and Red-shouldered Hawk all in view at once in the five minutes I was there! The South Cape May Meadows/TNC Cape May Migratory Bird Refuge was hopping, too, with Nashville and Prairie Warblers seen on the CMBO walk with zillions of Swamp Sparrows, with a few White-crowneds, Savannahs, and a Lincoln's Sparrow along the main path. A fair number of Purple Finches were flying overhead, and we had Pine Siskins at the start of the walk. 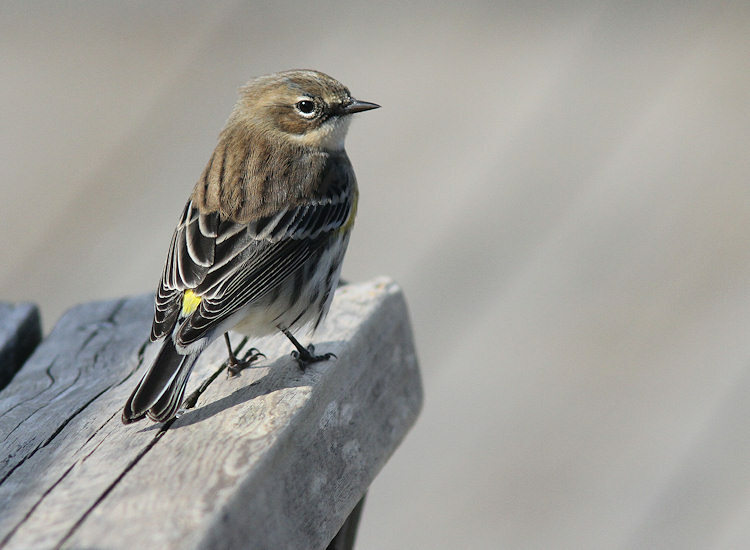 The radar was sure lit up with birds last night, and Higbee Beach WMA, though mosquito-ridden, had plenty of kinglets, Yellow-rumped Warblers, and other typical late season migrants. There were a lot of more-ofs - more White-throated Sparrows, Swamp Sparrows, and Dark-eyed Juncoes than recent days, for example. A lot of Purple Finches were flying over everywhere I went today - their little tic note is a good one to learn - along with a few Pine Siskins and, in more open areas, quite a few American Pipits. 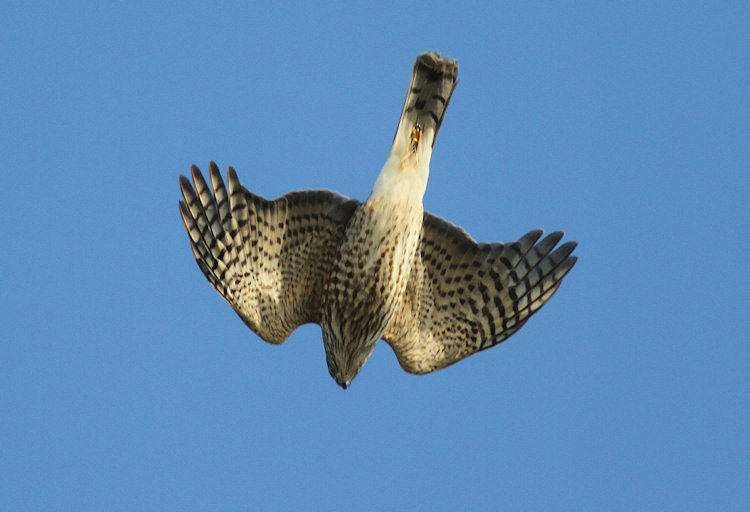 The hawk flight seemed good this morning, but lighter than yesterday. I have not heard any more on yesterday's Sandhill Crane or Whimbrel. Tom Reed had some interesting stuff from his vantage 15 miles or so up the bay at Reed's Beach, including a morning flight of 3200+ Yellow-rumped Warblers, 1500 American Robins, and close to 200 Sharp-shinned Hawks. 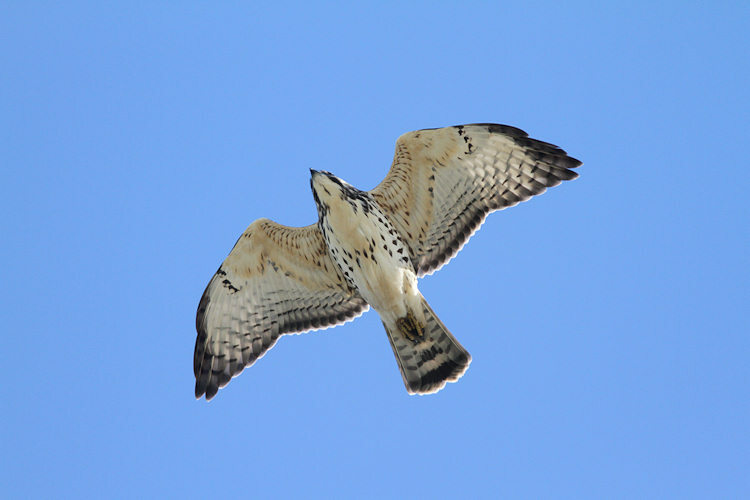 One of the most common questions we get at the hawk watch, and morning flight, is "how do you know you are not counting the same birds twice?" Flights like the one Tom had this morning give insight on what the birds are doing - they round Cape May, and (for the species that don't like crossing open water) turn north and fly up along the bay. We still undoubtedly do double-count some birds, but not many, and that's not the point anyway - by using the same methods every year, we create an index of bird populations in order to detect downward or upward trends. With only a couple hours to bird, I started in the pre-dawn darkness, oozing around some little-birded areas hoping for close looks. A little later I wandered the Red Trail of the State Park, which held a similar mix of species to Higbee plus, of course, its suite of ducks, including the female Eurasian Wigeon on Lighthouse Pond. 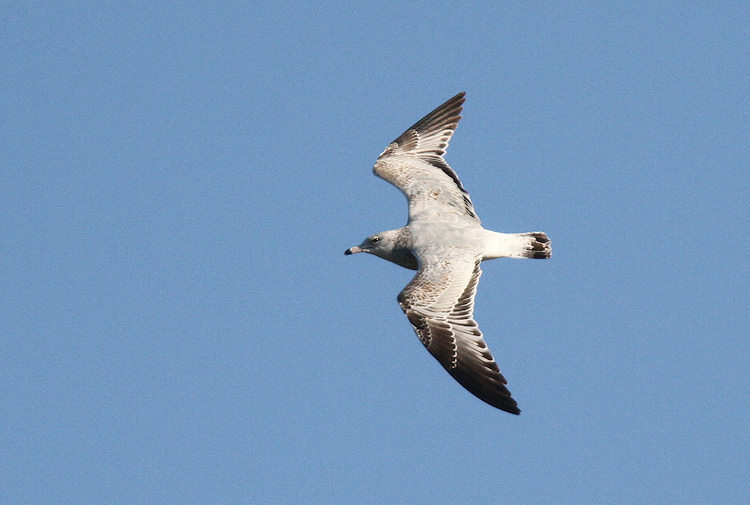 One of my very favorite places phrom which to photograph is the Hawkwatch Platphorm at Cape May Point State Park. 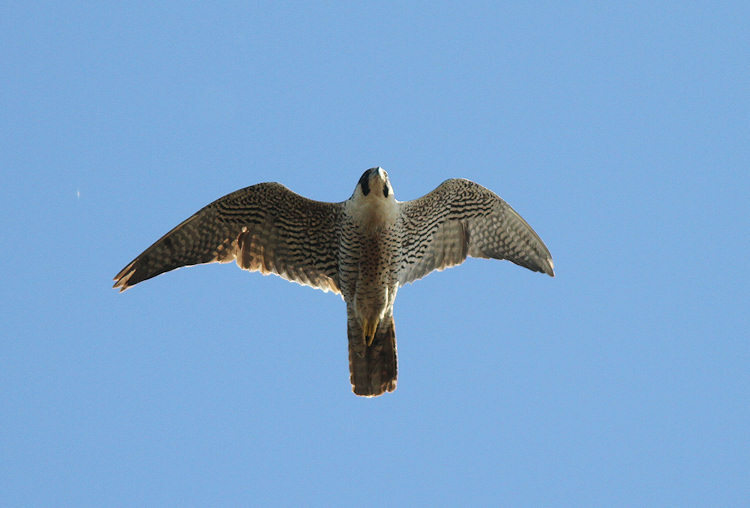 The reasons are many and varied, but include the commanding view of the sky, the variety of nearby habitats, and the camaraderie of the hawk counter, hawk watchers, and other photography aphicionados. (All right, already, enough with the 'ph' stuff!) 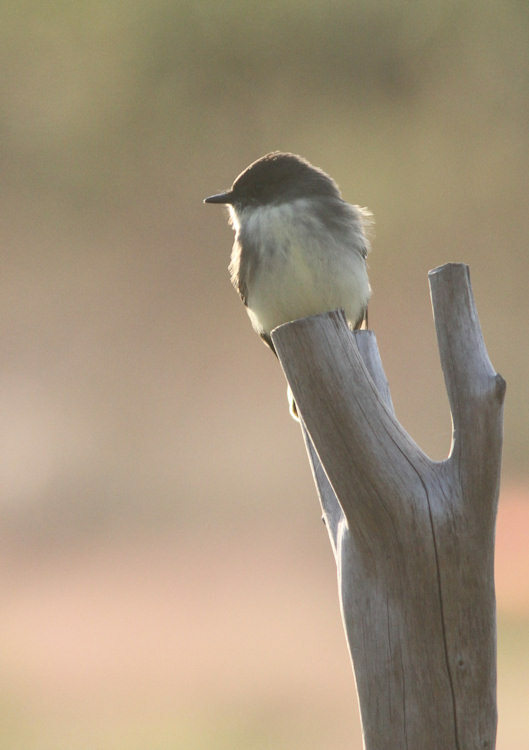 The variety of habitats ensures a good variety of birds and the view and the numerous other birders usually present ensures that anything flying by will be seen and, thus, photo ops will be had. One of the other main reasons is that I like photographing stuff in flight. Today (16 October) was just about a photographer's dream: lots of birds, lots of birds close, and lots of birds close and low. 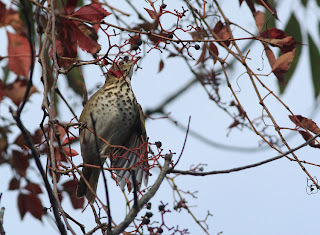 Though a nearly all-blue sky was the backdrop most of the day, unlike most blue-sky days, the birds did not get high and out of or nearly out of sight. That fact was due to the, one might say, 'brisk' breeze blowing all day (20-25 mph, gusts to 40 mph). This kept the raptors 'on the deck' all day. 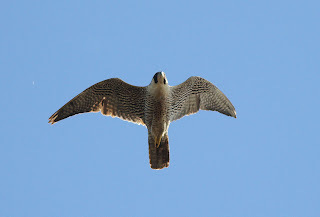 Now we get to why I noted that it was 'just about' a photographer's dream: the wind also made for erratic flight in most of the smaller species, as they responded to flying into the northwest wind and the vagaries of gusts. One might be tracking an individual bird quite nicely only to have it suddenly disappear from the viewfinder, as it rode an updraft, got sucked downward by a downdraft, or knocked to the side by a sudden gust. All in all, though, there are very few days for which I would have traded today. Below, I present a sampling of photos that I took from the Hawkwatch Platform today, with captions providing some interesting tidbits about the picture, the bird, the species, or the event. Click on individual pictures to see larger versions. [One of the few types of birds moving today -- other than raptors -- were Killdeers. Though we didn't see all that many, singles and small parties passed sporadically through the day, totalling some 40 or so. One of the >5000 Tree Swallows present snuck into this picture. [Not the commonest sight from the platform, this meadowlark is easily identified as an Eastern by the extensive white in the tail. [Merlin gets two representatives in this essay's set of pictures because it's just such a..., well, is 'opposite-of-good posterior' a reasonably family-oriented term? 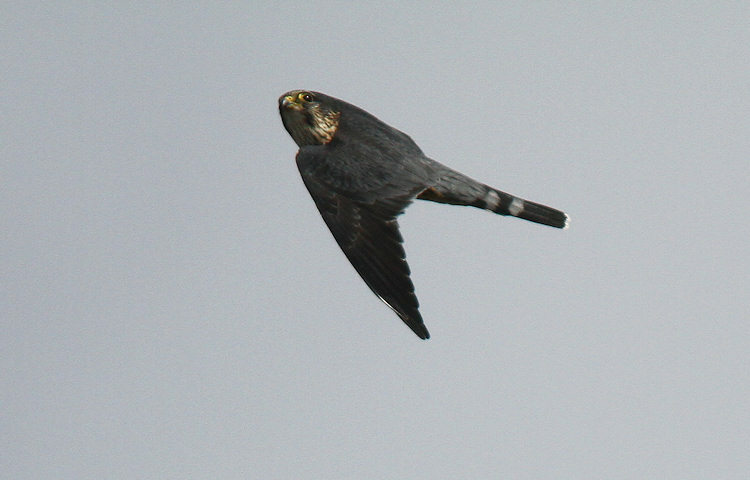 This Merlin was one of many passing the platform today that had apparently swallowed golf balls. No, what's inside their crops (food-storage sections of bird alimentary systems) aren't white and dimply, but probably feathered. Which tends to bring up the tongue-partly-in-cheek game on the platform of 'Guess the Lump.' At this time of year, Myrtle Warbler is the most common item on the Merlin menu, mostly because of its sheer abundance. 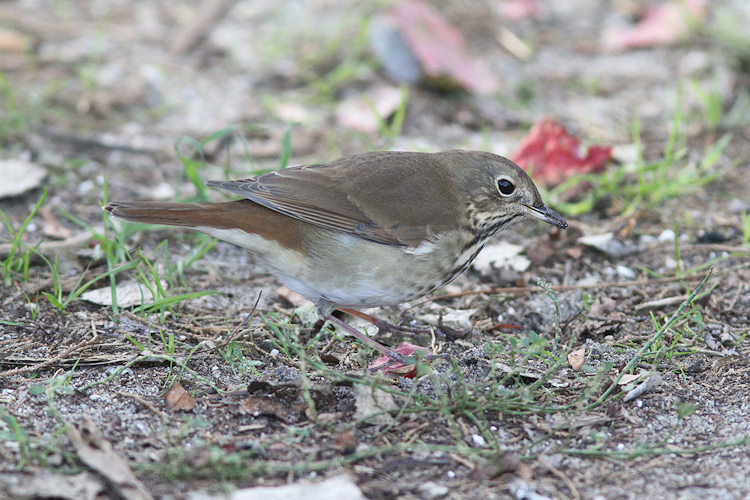 Because a lot of the Merlins passing through hunt the dunes, Palm Warbler (and it's different-tasting varities, Yellow and Western) is another item on that menu. 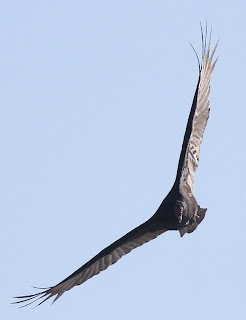 Of additional interest to those with a fascination with molt are the two ages of feathers on the wing linings (blacker new feathers, browner old feathers) and the old outer two primaries compared to all the other primaries being new.